Miletus Group, Inc. has joined forces with Jobsite Leasing Company to make mobile and modular offices eco-friendly. The Green Fleet™ marks a first in the industry, which has lagged behind conventional commercial building in terms of sustainable building practices. Mobile field offices, long a staple of the construction industry and present on virtually every construction site of medium and large construction projects around the world, are easily ignored as a ‘real’ building type. When energy costs associated with the use and operation of Jobsite’s fleet of mobile and modular field offices started generating customer comment Jobsite decided to examine the possibilities of developing a green mobile building with the modular design experts at Miletus Group. Miletus Group accepted the challenge. Miletus Group president and project spokesperson James B. Guthrie, AIA points out, “Our team spent a great deal of time analyzing the best sustainability practices in the building industry and then found ways to apply them to the mobile and modular office building sector.” Little will appear changed to office occupants in terms of the general layout, construction, and convenience of the high performance units, according to Guthrie. However, he states noticeable differences will appear in the form of substantially lower utility bills and significantly higher levels of comfort during hot summer and frigid winter months. 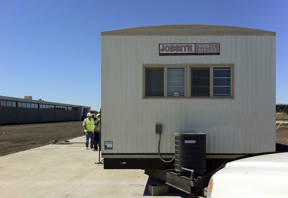 Because this industry is highly cost driven, Jobsite first commissioned Miletus Group to perform a cost analysis to determine the feasibility of building high performance mobile and modular offices. Guthrie and his team began by doing alternative preliminary designs and then running a series of Department of Energy and USGCB LEED approved building performance computer models. The models provided a baseline analysis of the existing fleet against alternative design approaches. The results quickly proved that energy savings would offset initial green building costs. “The computer models were invaluable in assessing different approaches and creating a strategy for building procedures,” says Guthrie. With the help of the computer models, the manufacturer incorporated refinements in materials and production, which led to new efficient and cost-effective sustainable practices in the building of the High Performance Mobile Offices™, and a greater than 50 percent reduction in energy use. With the help of the Miletus design team, Jobsite was also able to dramatically reduce construction material waste, 95 percent of which is now recyclable. Additionally, the materials selection process was overhauled to include purchasing only from vendors that offer the largest inventory and highest degree of recyclable products on the market. The green building measures assured that the High Performance Mobile Offices would be 100 percent recyclable at the end of its life cycle. Moreover, Guthrie, who counts among his green building credentials, certified Green Advantage practitioner for commercial and residential construction, U.S. Green Building Council member, and member of the Modular Building Institute’s International Green Code review committee, expects ongoing field-monitoring reports will show building energy usage of sustainable-built High Performance Mobile Offices to be as little as one-third that of conventionally built, standard industry mobile offices. This entry was posted on April 7, 2011. It was filed under Miletus News and was tagged with AIA, Green Advantage, International Green Code, James Guthrie, Jobsite, Jobsite Leasing Company, Miletus Group, mobile and modular field offices, Modular Building Institute, The Green Fleet, U.S. Green Building Council. Thanks for finding the time to explain the terminlogy towards the inexperienced persons! Love the new design. I really liked the content. Thanks a lot for a marvelous blog.